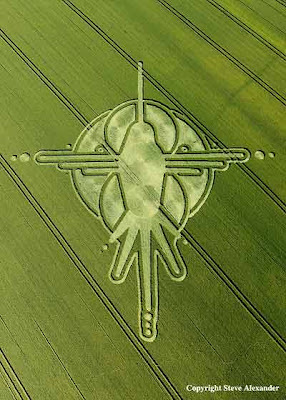 The Hummingbird Nazca Lines Peru Crop Circle ... Reported on July the 2nd at Milk Hill, near Stanton St Bernard, Wiltshire. The Hummingbird symbolizes many different concepts. Because of its speed, the Hummingbird is known as a messenger and stopper of time since it hovers in one spot and appears to be motionless (thus appearing to stop time). The Hummingbird is a messenger of hope and jubilation. The fluttering wings of the hummingbird move in the pattern of an infinity symbol - further solidifying their symbolism of eternity, continuity, and infinity. * "Where is your joy?" * "Is your happiness found within, or do you seek it externally?" * "What is the source of your joy?" * "What must you do to increase your joy?" 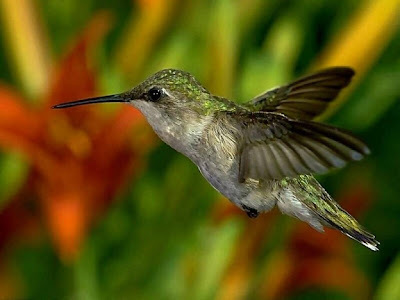 The Hummingbird animal totem's most important message to you is : "The sweetest nectar is within!" Love the sacred art in the fields ! Extremely powerful transformative frequencies coming our way ... awakening divinity ! 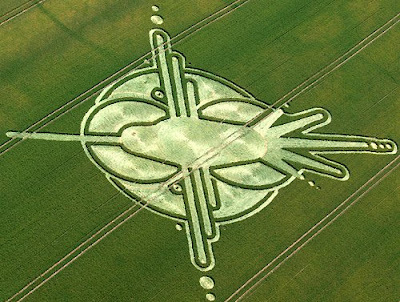 Are there any other crop circles that look like the nazca Lines in Peru??? I can't help but wonder how these designs are (purportedly) made at night. The beauty and perfection are awe inspiring. I have counted over 520, what appears to be airport runways, in between nazca and palpa peru. The animals are mingled in between these trapezoid and square runways one of which is the hummingbird. If you look closely you can see that a section of mountaintops were leveled into one of these airport runways. The funny thing is that lines and animals in peru can only be seen by air. 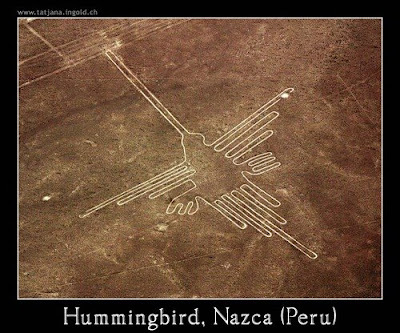 I'm trying to find these shapes in other parts of the world so you can imagine my surprise to see the shape of the hummingbird in a crop circle. I always heard about the lines of nazca but never realized that the desert in that area has thousands of lines etched in the ground which must have taken decades to produce and the biggest question is...Why? I need to say this better; I have an affinity with hummingbirds. I believe what the glyph is showing us is a changing from one lower consciousness to a higher one. And it's only about halfway done. So more to come. I also think there's a symmetry in the construction related to the cross. The wings expanding through the whole makes it an all encompassing change throughout the cosmos and that the smaller circle outside the wings are potentially thought vortices heading off in all directions. The cross doesn't have to mean something from Judao Christian teachings but could be the crossing point of the sun's ecliptic with the galactic plane. Yo no se escribir muy bien el ingles pero si puedo decir que estas aves son algo maravilloso.Y lo digo porque en una ocasion una de estas aves me dejo tocarla, la razon no la se pero realmente me gustaria saberla I LOVE THE HUMMINGBIRDS.